In the last three months, over 1,200 people have taken The Culture Test. Here is a summary of the data. The following bar graph breaks down the results by global regions. But that is not the entire story. To understand the predominance of honor/shame cultures globally, we must account for the population size. The length of each bar in the below graph reflects the population of that region. Americans and Europeans feel guilty, the rest of the world feels shameful…I mean, Westerners feel innocent and Easterners feel honorable. European-Anglos are slightly more influenced by shame/honor than American-Anglos. This is primarily because of results from the Latin/Mediterranean cultures of southern Europe, such as Portugal and Spain. Asians and Africans have the highest score on fear, 21% and 22% respectively. 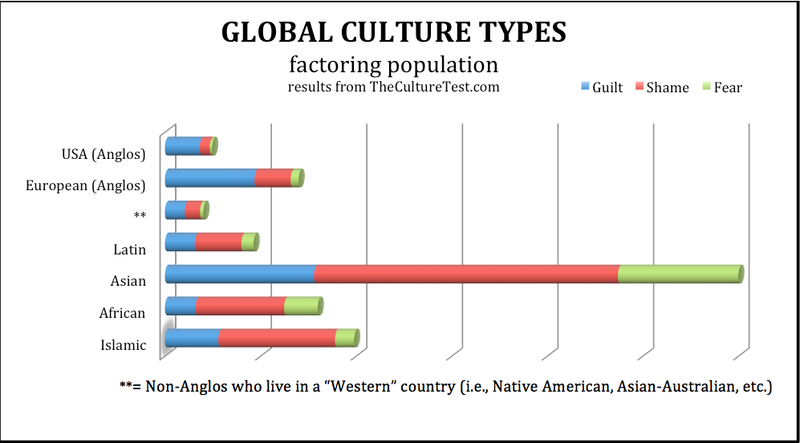 When non-Caucasians move to a Western country (** on the chart), they become more guilt-oriented and less shame-oriented. Latins are the most “balanced” culture (or, “the hardest to figure out!”). Africans are the least guilt-based. Muslims are the most shame-based. Globally, shame-based cultures are the most prevalent. For this reason a biblical theology for honor/shame cultures is missiologically imperative. Finally, none of the data was completely surprising (at least to me). But it is helpful to confirm what missiologists have generally suspected. This data is based on just over 1,000 results, which I consider a rather small sample size for analyzing global cultures. As more people learn their culture type, we’ll be able to provide much more accurate data, and account for other variables (i.e., age, gender, education,etc.). So, let others know about The Culture Test, and make use of it in your training ministry. TheCultureTest.com is foremost a training/learning tool; research is a secondary purpose. So I designed the survey to be accessible and engaging, not thorough and exhaustive. Nevertheless, there are trends which we can trace for missiological purposes, as I began to note above. What interesting/surprising things did you observe in the charts? To download a citable version (.docx) of this post, click here. To view and save a higher-resolution image, just click on the graphic. WOW … this is stupendous. Bravo! Praise the Lord for this very valuable research. Can’t say enough about how significant this can be to the world Christian movement. Like you said, none of the data is surprising, but I love the statement that “Globally, shame-based cultures are the most prevalent.” Serves us well to learn to engage with the worldview. For sure, as you have noted, the information is not that surprising. However it is great to see the information correlate with experience. Over forty years working in Latin America relates to the guilt, shame, fear mix shown by the data so far. Excellent! I do wonder if the Africa numbers could be skewed a little … with N. Africa leaning heavier Honor/Shame and Sub-Saharan Africa more Power/Fear? By the way, Werner Mischke, I was visiting in J.D. Payne’s office yesterday and guess who’s book was sitting proudly on his desk? Thankful for both “The Global Gospel” and honorshame.com! Nathan Harper … Yes, J.D. Payne has a copy of The Global Gospel. I hope he spreads the news of the book. (FYI–I sent all endorsers a free copy.) I am not surprised that in the culture test, Africans tracked more along honor/shame values than power/fear. All collectivistic societies are more honor/shame-oriented, and of course, tribal societies are collectivistic. I also believe that in Scripture, power/fear is more of a subset of honor/shame, based on passages like Psalm 110 and Romans 1:16, where power is articulated using honor/shame language. In the Ancient Near East, if you had power, your name was great and you were honored. This dynamic may be observed throughout Scripture. Nathan, I will thoroughly endorse Werner’s comments re Africa – serving in missions in Sub-Saharan Africa now for almost 14 years and having myself and others around us here participate in The Culture Test, the results just confirm our own research and observations that even this area of Africa is predominantly Honor/Shame. Awesome!…although I know the Culture Test was not primarily designed for research purposes it does make a very clear statement about the realities of honor/shame in our 21st Century world, and it does do what we have longed for – given some data confirming the predominance of honor/shame in Africa. Thankyou, thankyou thankyou for this summary data. 1. It keeps ‘Africa’ and ‘Islamic’ as separate categories thus giving identity and voice to data emanating from Sub-Saharan non-Muslim Africa, and clearly shows that power/fear is not the dominant dynamic in this area. 2. It was a surprise and very, very helpful to see that Africa is also the least guilt oriented. This gives ample reason why in reality, Western guilt oriented evangelism, discipleship and theological education here is therefore significantly ‘missing the mark’ and in fact missing the mark more than anywhere else in the world…. thus guilt oriented Western materials are definitely not the best to use for effective heart and life and community change impact – there is a great need for something more. 3. It was also very interesting to see that Asia (which is commonly referred to as ‘honor/shame’) and Africa (which is commonly understood as power/fear) are actually almost identical in their power/fear emphasis percentage (21% and 22% respectively). I have often wondered and expected that the difference was much less than what has been widely accepted and portrayed by these two labels. Now there is some data that demonstrates that there is virtually no difference at all! How sad that Africa was given the label of power/fear, keeping missions and ministries essentially blind to the dominant dynamic of honor/shame. Thankyou once again and may God use this data to speed forth the gospel more effectively. Regarding Africa…there were very few results from Northern Africa anyhow, but yes overtime it will be informative to separate out N. Africa and sub-Sahara Africa. Perhaps you could lead a STM into N Africa doing some cultural research via The Culture Test, which would surely open the door for great conversations!! About the fear-power category…it all depends what you mean by the category. If fear-power refers refers to social/political power, then yes it is a subset of honor/shame, at which point it would probably use the label “patron/client” to more accurately refer to it. But by fear/power I am referring to spiritual power- i.e., control/authority over the unseen world of spirits and Satan…more in line with missiology associated with “spiritual warfare,” “power encounters/evangelism,” “excluded middle,” etc. Although this is certainly related to honor/shame (possessed people are stigmatized/marginalized/shamed), to make it merely a subset of honor/shame tends could minimize how Jesus also also conquered the spirits, rescues us from the domain of darkness, and places us in a position of authority over all spiritual powers so that we no longer have to be afraid of them (Heb 2:14-15). From my time in Central Asia this component of the gospel is just significant and unique for many believers (and NT writers) to say its a byproduct of collectivistic cultures . (If anything, I would make guilt/innocence a subset of h/s [ala Romans 2:23], and perhaps suggest a 4th category of pain/pleasure…but for now will error on the side of simplicity and clarity…and stay with the 3 distinct categories). And BTW Sandra, your pun about Western missionaries “missing the mark” (the traditional non-relational definition of sin in Western theology) is too funny! Also, I added a link to a citable version (.docx) of this post at the end of the post, since people have asked how to cite this information. Saxons). Is that what your results are referring to? But then you seem to imply that Southern Europeans are included in the European Anglos. Yes, good point. Analyzing the entire global population into a few categories inevitably involves some level of being “imprecise.” For example, most Muslims (a religious identity) live in Asia (a geographical identity), so distinguishing how to categorize a Central Asian Muslim is a challenge. Technically, “Anglo” refers to someone from Britain, however the term is sometimes used to refer to “whites” in general, especially in contexts of ethnic diversity. Though not perfectly precise, that is how I use the term here, to mean “European,” “white,” or even “Caucasian.” Hopefully that makes sense; thanks for requesting that clarification! With 18 more months having elapsed since these results were published, I’m wondering if more up to date results are available. The test is available online in Spanish and English. 5 Pings/Trackbacks for "The Data on Global Culture Types"